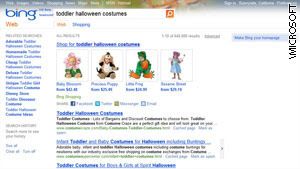 You may start seeing some familiar faces in Bing search results soon. Microsoft deepened its corporate friendship with Facebook Wednesday, announcing tighter integration with the social network into Bing's search results. Bing will display data from Facebook, such as user profiles and pages your friends have "Liked," to complement Web searches. For example, if you search Bing for Mark Zuckerberg, Facebook's 26-year-old chief executive, you might find a link to his personal profile, with buttons for sending him a message or adding him as a friend. That's in addition to the standard links to Wikipedia articles and news stories. A link on that same results page to the website for "The Social Network" could show pictures of your friends who have inidicated on Facebook that they "Like" that movie. The new Bing features will also show up in searches made from Facebook's website. Microsoft's Yusuf Mehdi was unambiguous about his excitement for the Facebook partnership. "This is going to profoundly change how we search," Mehdi, the company's senior vice president for its online audience business, said at the news conference. Last week Yahoo added new features to its search results pages, which are powered by Bing. In addition to slideshow enhancements and a new shortcuts feature, Yahoo began pulling in some photo albums from Facebook. Despite advancements by rival search engines, market leader Google continues to gain. Google was used for 66 percent of internet searches in September, according to market research firm comScore. During that period Yahoo had 17 percent and Bing had 11 percent, the report said. But Google has struggled to form partnerships with Facebook. The search giant says it wants to tap into the social network's 500 million users.